is a West African nation, bordered by Guinea-Bissau, Senegal, Mali, Sierra Leone, Liberia, and Cote d'Ivoire. Guinea also has coastline along the Atlantic Ocean. The capital of Guinea is Conakry. Officially adopted on November 10, 1958, the national flag of the Republic of Guinea is a vertical tricolor of red, yellow, and green. Guinea's long history stretches back to the great empires of West Africa, which included the Ghana Empire that was a strong power from 830 to around 1235, followed by the Sosso Empire in the 12th and 13th centuries. At the fall of the Sosso Empire, West Africa saw the rise of the Islamic Mali Empire, which persisted as a powerful governing force until around 1600, leaving behind many changes to the region, bringing a new religion, laws, and culture. The next and most powerful empire in the region was the Songhai Empire, which grew from 1460 until 1582 when it began its short decline. In the aftermath of the fall of that empire, Guinea was ruled by smaller kingdoms, including Futa Jallon, which was an Islamic state that existed from 1735 to 1898, and Wassoulou Empire. European explorers arrived on the coast of Guinea in the 16th century, and the slave trade soon became a major aspect of Guinea. The French dominated Guinea and its surrounding regions, with its colonizing efforts beginning in the mid-19th century. Guinea became part of French West Africa as the Territory of Guinea. As big changes were happening in France, the African colonies were granted greater autonomy, and in the case of Guinea, became independent in 1958. Guinea's first president as an independent country was Sekou Toure, who adopted socialism, first with the Soviet Union as a model but later turned to China. Guinea was invaded by the territory of Portuguese Guinea in 1970, though the Portuguese were ultimately unsuccessful. After Toure's death in 1984, a military coup in Guinea saw the new leadership of Lansana Conte, who ended the socialist rule. After his death, in another military coup, a new party came to power under the leadership of Moussa Dadis Camara in 2008. The people protested what they believed to be a rigged election in 2013, leading to internal conflict and unrest. Guinea has borders with Guinea-Bissau, Senegal, Mali, Sierra Leone, Liberia, and Cote d'Ivoire. 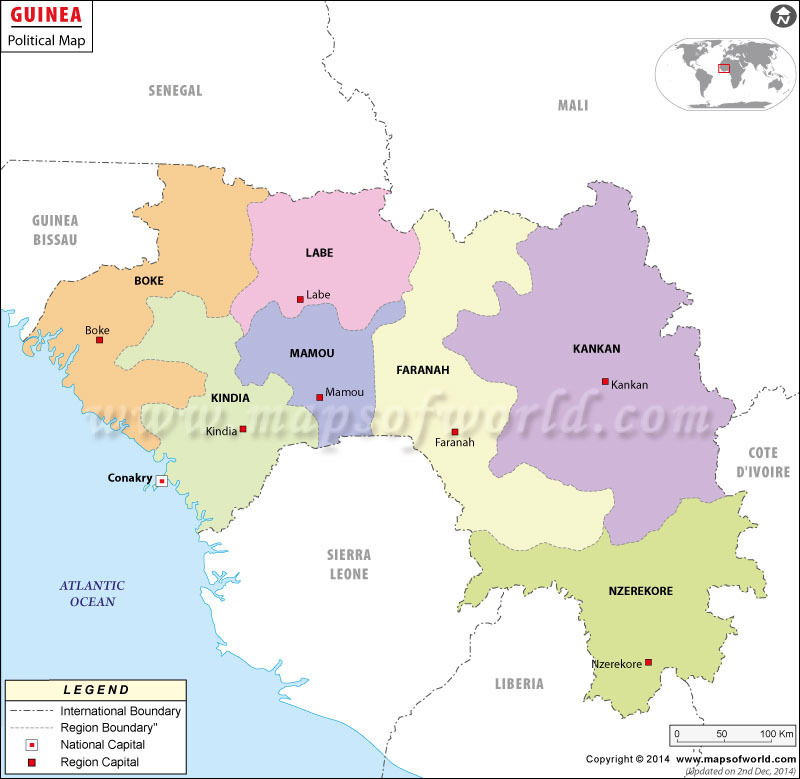 Guinea is a country in West Africa, with coastline along the Atlantic Ocean. The terrain of Guinea includes lowlands with forests and savannas, highlands, and rainforests. Along the coast are flat plains, while hilly inland regions lead to the interior mountains. The highest point in Guinea is Mont Nimba, which stands 1752 meters (5748 feet). Much of Guinea has a warm tropical climate. Guinea has several important rivers, including the Niger, Gambia, and Senegal Rivers, and many African rivers originate in the country. The capital, Conakry, is the center of activity as well as trade in Guinea. The city offers the Guinea National Museum, and architectural sites including the Guiena Palais du Peuple, and Conakry Grand Mosque. Natural sites near Conakry include the Soumba waterfalls and the Atoll Island which requires a boat from the capital. Another important city is Kankan, which offers cultural activities including its Mamaya dance during Ramadan, as well as a look into the lifestyle of the people. For outdoor recreation, Mount Nimba Strict Nature Reserve, located along the border with Cote d'Ivoire, has been designated a UNESCO World Heritage Site. National Park of the Upper Niger is another recreational destination, and is a habitat for a variety of indigenous wildlife, including hippos and chimpanzees. Islands off the coast, like the Loos Islands offer beaches and forests for exploring. Overall, Guinea is lacking in its infrastructure. Guinea's capital, Conakry, is home to its main international airport, which is called Conakry International Airport. Conakry offers service to Europe and some destinations in Africa. Otherwise, cars are the only real option for visitors, as there are no buses or passenger trains. Cars can be used to enter the country, but borders between some neighboring countries can be dangerous and even closed. The roads, however, are mostly unpaved, making the drive long and slow. Around the towns, taxis including the bush taxi and the taxibike are the most common ways of getting around. Taxis are an inexpensive way to get around, and can be hired for an entire day. Traffic congestion can get very severe in Conakry.